Featuring visual artists of all mediums in their studios in the DC, MD, VA area. 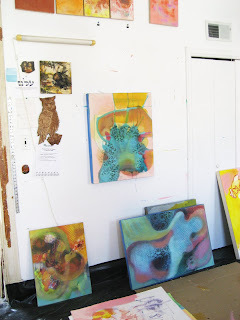 After a long hiatus due to spring and summer craziness, I am happy to resume my posts with a studio visit I had this past spring with DC artist Pat Goslee. 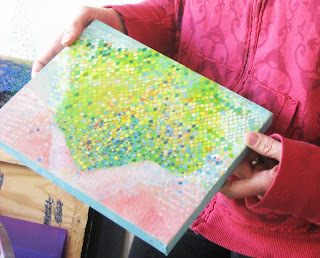 I was first introduced to her work back in 2002 and I was excited to see the transformation from the the textured encaustic pieces to now the layer upon layer of delicately painted forms oozing with tons of color on canvas and on gesso board. Combining water based oils with spray paint Pat talks about what makes her tick. You'll be able to see her paintings in person at three venues this fall including two solo shows. The first one at the McLean Project for the Arts www.mpaart.org opens on Sept. 11 and runs through October 25. The opening reception is on Thurs. Sept. 18 from 7 - 9 p.m. 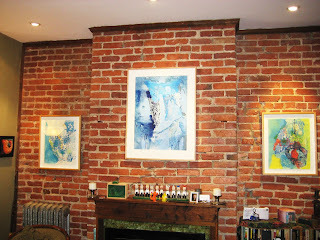 The second solo show will be at the District Center Arts Center (DCAC) in Adams Morgan www.dcartscenter.org. See www.patgoslee.com for more details on these exhibits and her work. "Some people can't tolerate this state. It requires a kind of intellectual courage in the face of questions for which there aren't easy answers. Questions that straddle the line between theoretical physics and philosophy. Questions about the nature of existence itself. At the same time, there's a freedom in the unknown. Freedom to operate through intuition, tapping into what Jung called the collective unconscious. " "I never begin with an idea. Rather, I use what I call a shotgun method, working on lots of different paintings at the same time. Some days, I mix up only one color and apply that one color to 24 different paintings. 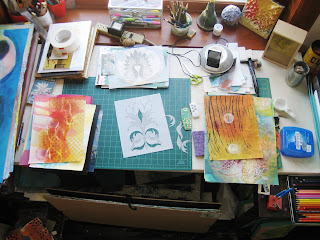 Some days, I simply sit in my studio for a length of time. Because my studio is in my house, I can do this while brushing my teeth, in my underwear. The main focus of my current work is pattern, which I first came to through encaustics 11 years ago. At the time, I had been layering hot wax on top of various materials -- cheese cloth, mesh netting, etc. -- in order to build up surfaces to a sculptural level. Eventually, I put the wax aside. I just picked up some of the materials that I was using to build up the surfaces and I dipped those into paint and applied them directly to the canvas -- a kind of decalcomania, like Max Ernst used to do. In the layered patterns I created, I discovered a kind of infinity that was not just space, but energy. More and more people seem to be making this kind of work: Inga Frick, Carol Brown Goldberg. " 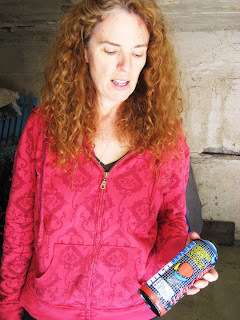 Pat's garage, where she spray paints. Views of her works on paper hanging in her home and Pat talking about her work in her studio. "One thing that excites me is how pattern and layering represent how we store "stuff" (information, emotional bagage, awareness). What do we take in? What do we filter out? What layers need to be removed, or rearranged, in order to change? There's a lot of back and forth when I work. Foreground changes to back ground, and background pops in to foreground. I can get lost in the patterns, whether it's cutting stencils or just drawing with colored pencils on a painting on paper. " 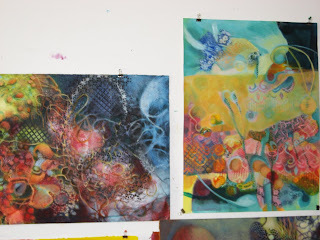 Two paintings on paper hanging in her studio. Showing me the kind of spray paint she uses. A large painting on canvas titled "Charisma" which is on her website. "The most important thing is to try and stay open. Knowing that I dont know, but letting knowledge flow through me. We are all energy conduits, blocked to a greater or lesser degree. 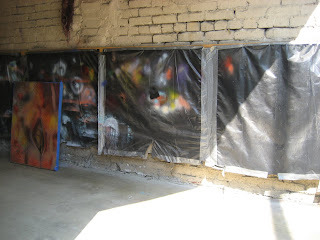 My paintings are a way of visualizing that energy." The Studio Visit seeks to feature artists in their natural element: The Studio. Sharing these visits online promotes artists and their process, and in turn, connects them to the general public. It is a venue that is committed to cultivating a symbiotic relationship between artists, galleries, curators, writers and collectors with the hope of creating a more collaborative and connected community through the appreciation of the art making process and ultimately, the art object. 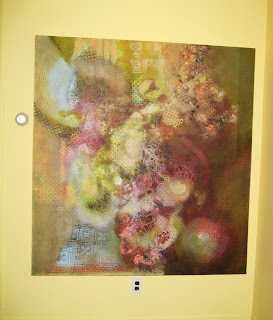 Click Here to see the article on Voted Best Art Blogger for 2008 by Kriston Capps. 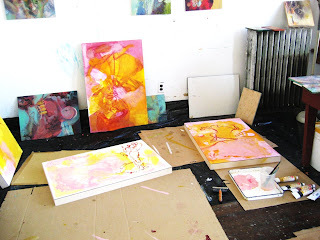 The Studio Visit is On The Pink Line Project Website! 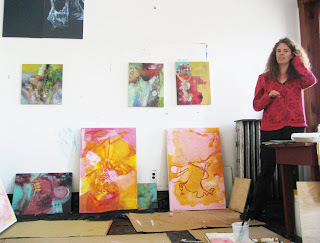 See latest studio visit chats on the Art Chat link on Philippa Hughes' encompassing site of everything happening in the DC area art scene. A curated space for contemporary art. Free artist portfolios by invitation and application. Isabel is an artist, educator and mother of two living in DC.